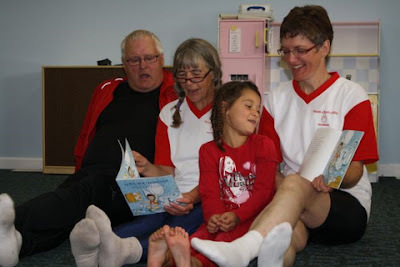 2009-09-10 - Westlock Update! and New Chapter for our Story. I spoke with Helen today! She is OK and not in pain, but she suspects that her arm is BROKEN! 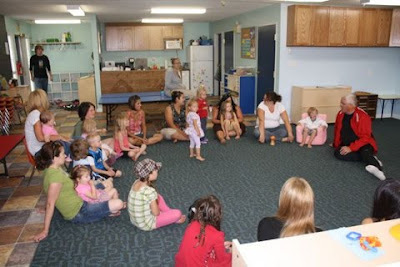 She has an appointment in Camrose just after they are scheduled to arrive back in at Sparling School tomorrow. Helen even rode 4km today, and hopes to do a bit more tomorrow. What a trooper! There is a new update to the Story! Click Here!! Chapter 4, from McLennan. The four words are Marvellous, Awesome, Cool, and Spectacular! You have to read it to believe it. The team is on schedule. 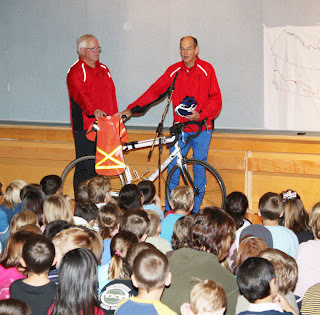 They enjoyed their presentation at the Westlock Elementary School, and are now heading for Sherwood Park. Today is cool with some light showers, but nothing compared to the first part of the trip!! They are all looking forward to getting Sparling School tomorrow afternoon. Please come out to cheer the team home. They expect to be at Sparling School around 2:30pm. Alan and David talking about Bike Safety! Sheralyn called me tonight and we had a long chat! Good news - and bad! 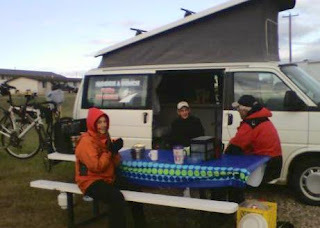 Last night, after a day of riding in the rain, as they pulled into Slave Lake, Helen needed a "Tim's". She pulled into the parking lot and into a handi-cap zone with her bike. Unfortunately she had technical difficulty with her dismount (couldn't get her foot out of the toe clip). She fell onto the handicap sign and hurt her arm. The team took her to the hospital, where she was checked out. She is now wearing a splint that starts at her wrist and runs almost up to her shoulder. It is held on with three tensor bandages. Helen is in good spirits, but couldn't ride today (she tried, but it hurt too much). 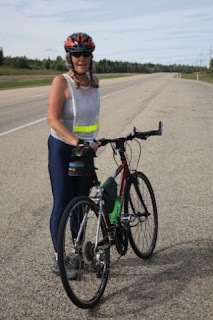 She probably won't be riding tomorrow either, but we hope she can join the group again to cycle back into Camrose on Friday! Helen in a wheelchair in the hospital with her arm in a splint! This morning, the team made a presentation to CJ Schurter School in Slave Lake. A lot of fun was had by all! 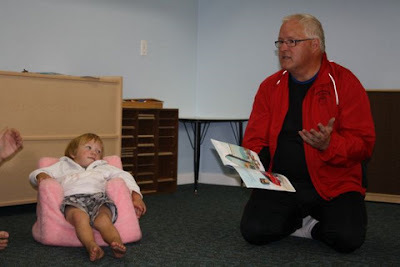 To celebrate literacy, the school, which has a protected reading time every day, read a total of 15,831 minutes (all yesterday) in honour of the Munsch a Bunch project, and to support Literacy. WOW! That's 10 minutes for every kilometer of our journey! Alan, David, Sheralyn and Helen reading "Zoom" at C.J. Schurter School. David even won a "Hoppy Award" (a green certificate that looks like a frog), because he was nice to someone in the school office and made them Happy! CJ Schurter School is an "I Care" School. The school is K-3 and has 400 students. Kids are always impressed with the map showing the route! After the presentation, the team headed for Westlock. Today was the best day for riding yet. Sheralyn says the number one piece of equipment required was a pair of sun glasses! With Helen not riding, the others had to make up the difference, so it was a record distance day for David, Alan and Sheralyn! Even though Helen couldn't ride, it didn't mean she wasn't contributing to the team. At one point, she had pulled over with the van to wait for the rest of the team. While waiting, a truck full of men pulled up in front of her and got out. They saw the cyclists, and the graphics supplied by Windwood Signs on the side of the van. They wanted to know what the tour was about. It turns out that they are cyclists also, and have done some similar rides and fund raising. They were on a hunting trip, but had been rained out. They left Helen with a $60.00 donation! Good Job Helen. Dave - Tuning his Bike! It's hard to believe that there are only two riding days left in the trip. Tomorrow night, the team is looking forward to dinner with David and Helen's daugher-in-law in Sherwood Park. After that they will ride out to Ministik School where they will camp the night and be prepared for the presentation the next morning. Watch for another chapter of our Story Tomorrow! Our team has been too busy, too wet, and too cold to send me daily updates, so we missed yesterday; but I did receive an email and a text message today - so here is the update. Monday, there were no presentations, and as reported on http://www.twitter.com/miles4literacy the team actually had a tailwind for most of the day. 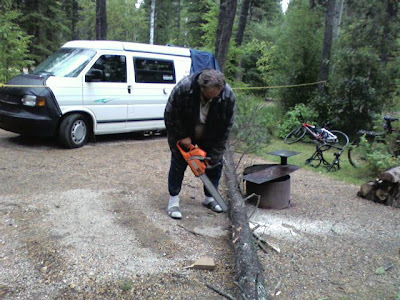 When they arrived at McLennan, the campground was closed for the season. 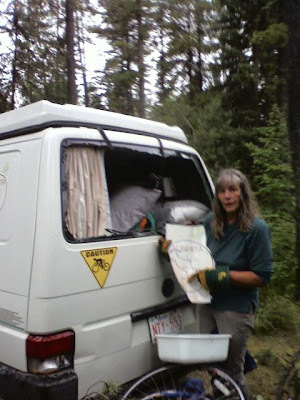 Fortunately, the lady who manages the campsite, and lives there, opened the gates and let them stay. 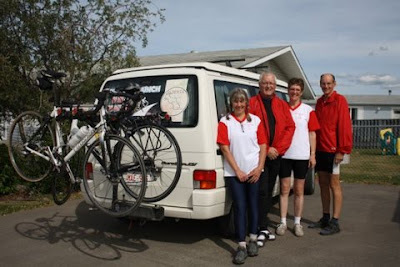 After a presentation to the École Providence School in McLennan, the team started cycling to Slave Lake. The weather did not want to cooperate. It was cold and rained most of the way. Tonight, the team has found a laundromat in Slave Lake, and is busy drying out their clothes and trying to warm up so they will be ready for tomorrow. 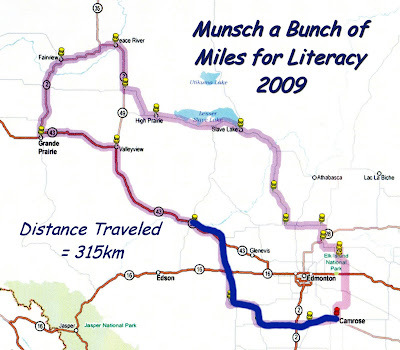 2009 Miles for Literacy STORY. Each chapter will have the four words in bold font. We may not be able to post a chapter every day, because we don't always have access to the internet along the way. Please be patient, we will post the chapters as soon as we can. The first three chapters are now on the site. Our story does not yet have a title, if you have any ideas, please either leave a comment or email us at info@miles4literacy.com. 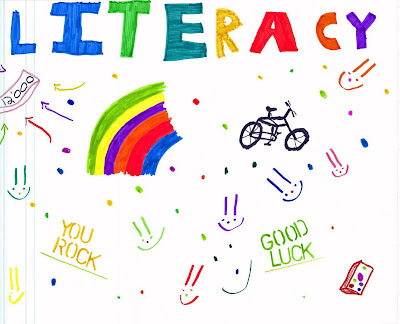 Please remember to support our local Literacy Programs. 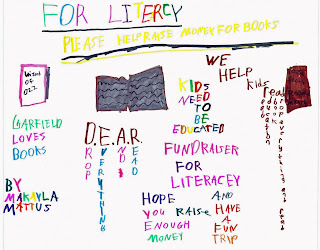 You can download a donation form at http://www.miles4literacy.com/donate.html. Helen -still ready to go!